No one should go into this book without having read the first two. The world Ms. Saare has built is so compact, so tight, that every action from each work has an ostensible reaction, and without that knowledge head-on, there is no way to appreciate The Ripple Effect. Wow. Wowie wow wow. I’m going to do my best to keep this succinct as this is one book you definitely don’t want spoiled. Rhiannon Murphy has had a lot on her plate since she time-traveled to a dystopian future and saw what would become of the world if everything remained on its current course. Yet the hell that awaits her when she returns almost makes the nightmare of the future look like sunshine and rainbows. Disco, the man she loves, violated her in a way that seems unforgivable, and that’s not the least of her problems. To say The Ripple Effect is about consequences is really underselling it. There are so many underlying themes, not the least of which is the power of forgiveness, the awesomeness of love, and realizing strength comes from many places. Rhiannon isn’t an easy character to love. She’s tough and gritty, and sometimes so damn stubborn you want to punch her in the mouth. Without knowing everything that she went through and the things she’s had to learn—the things to which she’s had to adapt—it’s easy to walk away feeling she’s been stupid and selfish. I won’t be surprised if this is the reaction she garners at first. To those readers, I ask you simply to take another look. Rhiannon has never been a “people person,” and it took her a long time to share as much of herself as she did with Disco. She traveled to the future to sever her lover’s debt, and saw a world she wants very much to avoid. In desperation to return to her home, she made some deals on the fly and did some things she regrets. And upon returning, the homecoming she wanted isn’t the homecoming she gets. What makes this series so good, and Ms. Saare such a great writer, is the characters’ actions and motivations. So often in fiction we see characters doing things they should, not things they would as people with their own desires and weaknesses. No one in this story escapes unscathed, and likewise, no one in this story is blameless for what happens to them. Instead of a black and white canvass with the good guys and bad guys clearly established, we have flawed people doing their best to make it through their flawed world. They don’t always get it right, but they always try. Rhiannon’s actions might be irritating as hell, but don’t we all know someone who acts against their own best interest without realizing it? Don’t we all know someone who makes a decision no one agrees with? Haven’t we been that person before? This is the strength of the writing, and why the series has resonated so much with so many readers. Having said that, be prepared to squirm, and not for the fun reasons. Ms. Saare doesn’t flinch when she inserts you deep into the realm of demon society. There are parts that are painfully gruesome to the point of unbearable. Yet the payout is more than worth it. Trust Ms. Saare to get you to the end, for all the pain and heartache, you'll find such poetry in the novel's final pages. Ultimately, this book is about realizing how liberating acceptance and forgiveness can be, especially when preparing for the fight ahead. Trust me, readers, you won’t regret it. J.A. 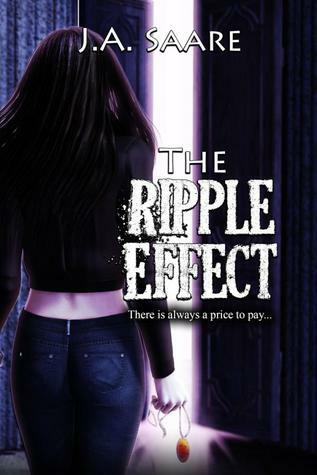 Saare's The Ripple Effect is now available!